So, alas, because seventy years has passed since the discovery of the camps, we have enough films to make up a genre…Holocaust films. At the top of that list, the mighty “Schindlers List” has sat for some time. I’ll let others discuss the worst, since they are all important films, even if not successful. These films illuminate how different cultures have learned to live with it, how to explain it, how to deal with the accompanying rage and sorrow, and how we’ve lost touch with the actualities of the Shoah. 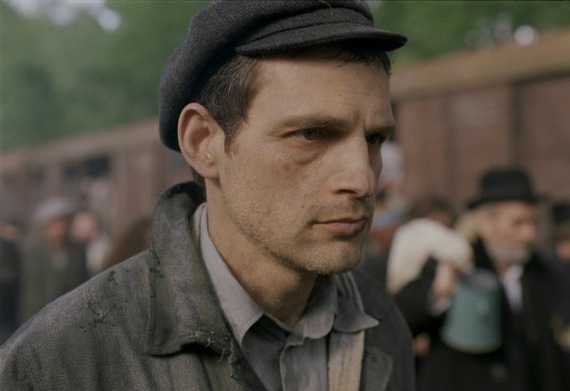 “Son of Saul” may provide you with the most viscerally horrific experience you will ever have in a movie theater. It also happens to be one of the best films I’ve ever seen. Where documentaries about the subject let us down because of the obvious black and white evidence of time passing, and where features let us down in their desire to tell us a story within the larger framework, Nemes, in his directorial DEBUT, simply states that this is what happened….every minute…every second. Dramatic gestures don’t need to be wrapped in plot…moments within mere minutes of life and death inside the camps are enough. Which isn’t to say there’s no dramatic structure. There is, and it works magnificently. But it feels like one in six million…not one above all others. The story revolves around one Sonderkommando – the Jews who were forced to push their fellow Jews in to the chambers, and then pull their bodies out. The camera never strays far from this one man, always staying within a yard or two. As a result, we don’t see this world through his eyes…we see this world IN his eyes. And it may sound counter-intuitive, but using this technique the world around him becomes a much more focused abject swirl of horror – sound, image, smell – unencumbered by the need to show us how specific moments play out. And this one man is played with such humanity by an actor with a miraculous face, Geza Rohrig – in his acting debut (which is unfathomable to me). When the screening ended, the packed house made not a sound…NOT A SOUND…as we filed out of the theater. Honestly, this film is so effective and affecting that it should, and will, become the most important film ever made about this horrible episode in our often horrible world. It’s a foregone conclusion that it will win the Best Foreign Language Oscar, and I don’t write that because it matters. I write it because that means, as a result, you will have ample opportunity to see it. And see it you must.